With only a few weeks remaining before the presidential election, and the start of early voting in most states, Jewish voters may still be weighing their decisions…writes Sean Savage/JNS.org. Over the last year, Democratic nominee Hillary Clinton and Republican nominee Donald Trump have actively courted the Jewish and pro-Israel vote, especially as they seek to firm up support in key battleground states such as Florida, Ohio and Pennsylvania – all home to large Jewish communities. How each candidate would support and strengthen the special U.S.-Israel relationship has been discussed in numerous speeches and debates by Trump and Clinton, as well as played a large part in crafting the platforms of both political parties. Both candidates have also met with Israeli Prime Minister Benjamin Netanyahu and addressed the premiere pro-Israel gathering, the American Israel Public Affairs Committee (AIPAC) conference earlier this year. JNS.org looks at the candidates’ positions and what they’ve said over the past year on major issues that may be important to Jewish and pro-Israel voters. Republican nominee Donald Trump addressing the American Israel Public Affairs Committee (AIPAC) conference earlier this year. Credit: AIPAC. 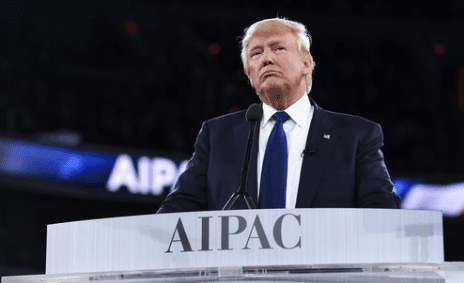 In a speech at the AIPAC conference in March, Trump said he will work to prioritize the U.S.-Israel relationship. “When I become president, the days of treating Israel like a second-class citizen will end on Day One,” Trump said, in reference to strained relations between President Barack Obama and Netanyahu. “We will send a clear signal that there is no daylight between America and our most reliable ally, the state of Israel,” he added. 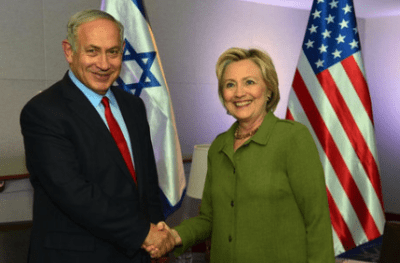 Democratic nominee Hillary Clinton meeting with Israeli Prime Minister Benjamin Netanyahu in September. Credit: Kobi Gideon/GPO. Trump has also said Israel should not cease construction in Judea and Samaria. “No, I don’t think there should be a pause…because I think Israel should have – they really have to keep going. They have to keep moving forward,” Trump told the Dailymail in May. Earlier this year, Clinton came out strongly against the BDS movement during an argument within the Methodist Church, which Clinton has been a lifelong member, over whether or not to join the movement. “I believe that BDS seeks to punish Israel and dictate how the Israelis and Palestinians should resolve the core issues of their conflict. This is not the path to peace,” Clinton wrote in a May letter to the heads of the Jewish Federations of North America. The Methodist Church ultimately rejected a resolution to divest from Israel. While Trump hasn’t made any direct statements on the BDS movement, his top Israel adviser, Jason Greenblatt, has strongly condemned it as the “modern manifestation of anti-Semitism, plain and simple. BDS hurts Israelis, Palestinians and the hope for peace. The BDS movement is not interested in promoting peace and coexistence. It is not interested in forging a better future for Israelis and Palestinians,” Greenblatt wrote in a Fox News op-ed in June. Opponents have criticized the Republican nominee for alluding to anti-Semitism in social media posts and in speeches as well as among his supporters. In early July, Trump tweeted a graphic critical of Clinton featuring a six-pointed star, a pile of cash and the words “most corrupt candidate ever.” Critics contended the graphic invoked anti-Semitic imagery due to its similarly to the Jewish Star of David. The six-pointed star graphic was eventually replaced with a new image by the campaign. More recently, critics condemned an Oct. 13 speech by the candidate in West Palm Beach, Florida, where he criticized alleged Clinton’s secret ties with international banks. “Hillary Clinton meets in secret with international banks to plot the destruction of U.S. sovereignty in order to enrich these global financial powers, her special interest friends and her donors,” Trump said. Similarly, the Trump campaign has been criticized for not distancing itself enough from neo-Nazis and white supremacists such as former Ku Klux Klan leader David Duke, who expressed support for Trump during Duke’s campaign for senator in Louisiana. However, the Trump campaign has disavowed and condemned any anti-Semitism being promoted by supporters on social media. In September 2015, Clinton endorsed the nuclear agreement in a speech at the Brookings Institution, saying that, “diplomacy is not the pursuit of perfection; it is the balancing of risk.” However, Clinton went on to say the deal would work only “as part of a larger strategy toward Iran” and that “distrust and verify” would be her approach to handling Iran. She added, “I will not hesitate to take military action” if Iran still sought to develop a nuclear weapon despite the commitments.